The comic book blockbuster event of the summer, Secret Invasion, continues to have everyone asking, "Who do you trust?" 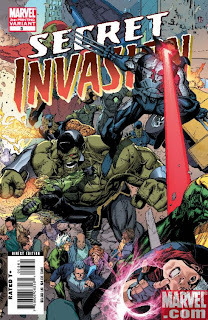 as Marvel is pleased to announce that Secret Invasion #3 has sold out at Diamond. To meet popular demand, it will return with Secret Invasion #3 Second Printing Variant featuring a stunning new cover from the interiors of superstar artist Leinil Yu! Join award-winning writer Brian Michael Bendis as he presents the third chapter of the epic invasion of the century with the fate of the Marvel U resting in the balance! Marvel urges retailers to check their orders on Secret Invasion and all tie-in issues, as they continue to sell out quickly at Diamond! It's the series you've read about everywhere from Entertainment Weekly to The Wall Street Journal--don't miss Secret Invasion!